When I listened to Vivaldi’s Four Seasons: Summer, the word "intertwining" repeatedly came to mind. There was a back and forth play between the instruments and the notes. They seemed to be separate but spiraling around each other and ultimately blending to create harmony. I felt a strong, building, upward motion that was an important part of the intertwining instruments. I also had a sense of bright light arising from the darkness. To me, the music represented a dance, the interplay of notes. 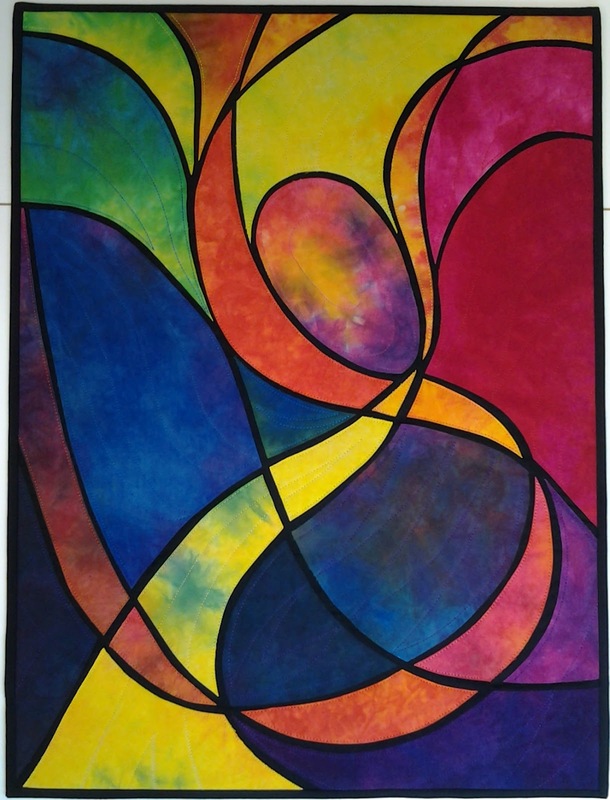 I could easily envision it as a ballet, and some of the curves in my piece “Color Dance” are intended to echo that grace.I tried to capture both the contrast and the blending of the sounds. The quilt is designed around three quadrants: red, yellow and blue. Where these areas touch, I transitioned to secondary colors to represent harmony and blending. Spiraling ribbons are the ascending, sparkling notes and black is the deep baritone, strong darkness from which the notes emerge. 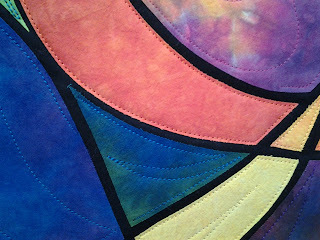 Individual pieces were fussy cut from several yards of hand-dyed fabric. They were then fused to a black background. I chose to keep the quilting simple and subtle and let the fabrics do the talking. Each piece is quilted individually in curves to enhance the illusion of upward motion. I enjoyed using music as inspiration. Often it is merely background noise, only peripherally affecting the creative process. To use it as the source, the focus, was an interesting endeavor, and one I would easily recommend. Beautiful- such an elegant interpretation Lisa-Marie. The colours of the hand dyed fabric really bring your design to life. This reveal is like opening presents at Christmas- the anticipation and sighs of delight! Lisa, I think you captured the movement, contrasts and blendings beautifully! I really think you captured the feel of the music, Lisa-Marie. The central theme, portrayed as an oval, with the melodies swirling around it, speaks to the rhythm of the piece. Fantastic interpretation. I appreciate the positive comments. It was hard to settle on the color scheme but I'm pleased with how it ultimately turned out. I love the colors and intersecting lines of this piece. There is definitely a dancer's spirit coming through. Lisa-Marie, this is wonderful - definitely the dancer's spirit Kate mentioned. The lights and darks play well with the curves woven throughout - I read it as the repeated phrases in the music. Interesting interpretation. Stunning! I am curious: what underlying fabric did you use for such clean edges (i.e., no fraying)? Thank you Margaret! I used the product "Wonder Under" to fuse the cotton hand dyed fabric to a black muslin background. I noticed a bit of wear on the edges as I quilted it due to so much manipulation, but I was pleased there wasn't much fraying. Thanks for noticing!